Oregon Beachcomber Blog - What's washing up? : Mystery of Sea Star Wasting Disease Solved? After what has been a very active year trying to understand sea star wasting disease, scientists at Cornell University and Western Washington University have identified what appears to be the culprit for sea star wasting- a virus in the same family that commonly affects canines. If you have a dog, you may be familiar of the parvovirus- a pathogen that causes rapid digestive degeneration, diarrhea, dehydration and even death in unvaccinated puppies. This same type of virus- named the Densovirus, was recently identified with genetic analysis as the top possible culprit in sea star wasting disease. 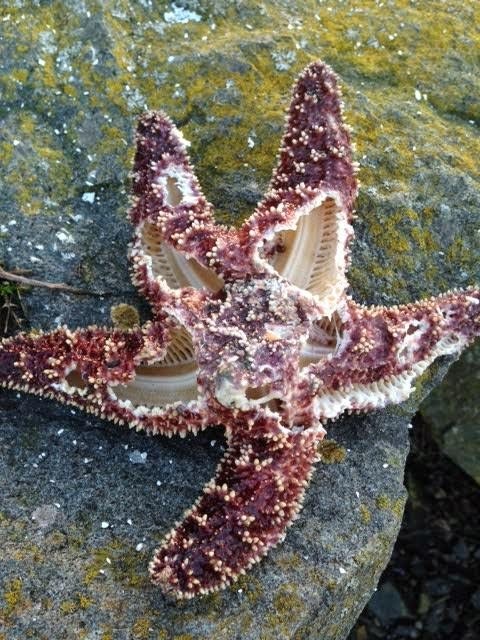 For the past year, scientists, beachcombers, and marine biologists have been taking stock of sea star deaths along the west coast of North America. Populations of important sea stars have been rapidly declining, while its victims appeared to slowly succumb to white lesions, and eventually completely 'melted' to death. Some sea stars are capable of surviving the disease, but until recently the entire phenomenon was a complete mystery. The National Science Foundation provided rapid funding for a group of scientists trying to solve the puzzle, and they believe they did. They were able to isolate and identify the Star Associated Densovirus (SSaDV), a virus that is commonly found in invertebrates, and has been present in archival museum samples of starfish. This discovery is also unique for being the first case of a virus being described in sea stars. Cases of sea star wasting disease have popped up historically, but this even has thus far been unprecedented in its severity and large geographical extent. Additionally, concerns were raised regarding the possibility radiation poisoning as a result of the Fukishima disaster, although this fear was repeatedly debunked. However, much work remains to be done in understanding how the virus works, why it has suddenly become an epidemic, why certain sea stars are more susceptible than others, and what, if anything, can be done to help alleviate the problem. There is still a long way to go before the epidemic may play out, but identifying the culprit is one large step in perhaps making a difference. or I will post the link to the original journal article when the link is working properly.